Today I took a trip from Swindon and visited Stonehenge. I took a bus from Swindon to Amesbury from where Stonehenge is only a twenty minute walk. The place was packed with bus loads of day trippers but I still really enjoyed the experience. 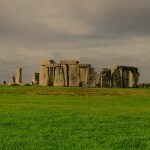 I would personally like to see the A303 diverted away and Stonehenge restored to its “golden era” using the traditional techniques and craftsmanship.